This is Roy-Toy's second package for the game. 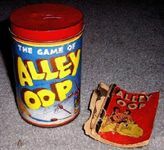 the first was named Alee-Oop. The package is a can. So it is about 3 inches in diameter and 4.5 inches tall.